Content: There’s some alcohol usage and talk of murdered children. Also, it feels really adult in its sensibilities. It’s in the middle grade (grades 3-5) section of the bookstore, but I’m not happy with that. On the other hand, it’ll languish in the YA (grades 6-8) section too, so I might just leave it where it is. Alistair Cleary is the kind of kid who blends in. He’s not popular at his middle school, but he’s not reviled, either. His best friend is a gamer — which is quite unusual, since it’s the fall of 1989 — but Alistair has managed to escape certain geek doom. He’s content to slide through life. Until Fiona decides that it’s Alistair who needs to write her sad tale down. And what a tale: Fiona insists that she’s been going to this imaginary land, Aquavania, which is absolutely real. She’s added months to her life in her trips (which become years later in the book). And that her friends in Aquavania — who also happen to be real people in the Solid World — are disappearing because someone called the Riverman is sucking their souls away. I had Issues with this book. It compelled me enough to finish it, sure, but it was one of those books that I threw across the room when I was done. I’ve been trying for days to figure out how to write about my issues, and to boil my problems with the book down into a neat, concise package, but I don’t think I can. There will be spoilers. My initial problems come from the incongruity between the cover and the book itself. The cover screams middle grade, but the content is very… adult. 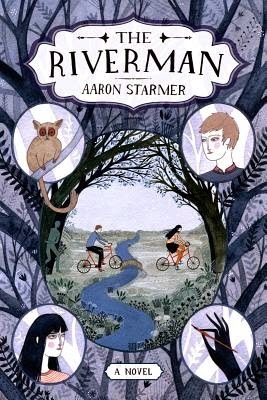 On some level, I feel like Starmer should have gone all the way, made this incredibly dark and sinister, used the metaphor that he was building — that Aquavania is a crutch for Fiona, who uses it to escape horrible things in her life — and made it an adult book. But, even though that is the set up for most of the book, Starmer doesn’t follow through. He pulls what I have come to think of as a bait-and-switch, a “HA! It’s Really REAL” moment. For which he has given us no basis in the rest of the book. Our narrator, Alistair, believes Fiona is making it up. He believes in the dark understory, so I do too. And so it’s incredibly unsatisfying (for me as an adult; would an older kid?) to have the rug pulled out from underneath you. I’m sure there I have other complaints (did it really need to be set in 1989? REALLY? ), but that’s the main one. Going in, I didn’t know what to expect, but by the end I hoped for a lot more than what I got. You're a lot more articulate than I was about what you didn't like, why the book didn't work for you. I just said I didn't get it. I've seen this at the library and almost picked it up because I've been in a middle grade phase lately. Very glad I didn't! This sounds like a book that would drive me crazy. Definitely not something I would expect from the cover or the age group. Thanks for sharing! Glad I didn't waste time on this one. Yep yep yep. The end of the book made me want to throw it at a wall. When I read it, I didn't realize there was going to be a sequel, which was even more frustrating. And do not get me started on the time placement. I do have lots to say about that. WHY INDEED. It should have been one or the other. It insinuates it's all fake or that it's all real, the story that Fiona tells, but when it reveals which, it feels like it's never fully committed. I wanted high fantasy or dark reality from this as well. It definitely it not something I'd consider MG but more YA. There's going to be a sequel, Brandy???? Talk about the most pointless thing EVER. Kristen: yeah, I agree about the MG/YA, and I ended up moving it.